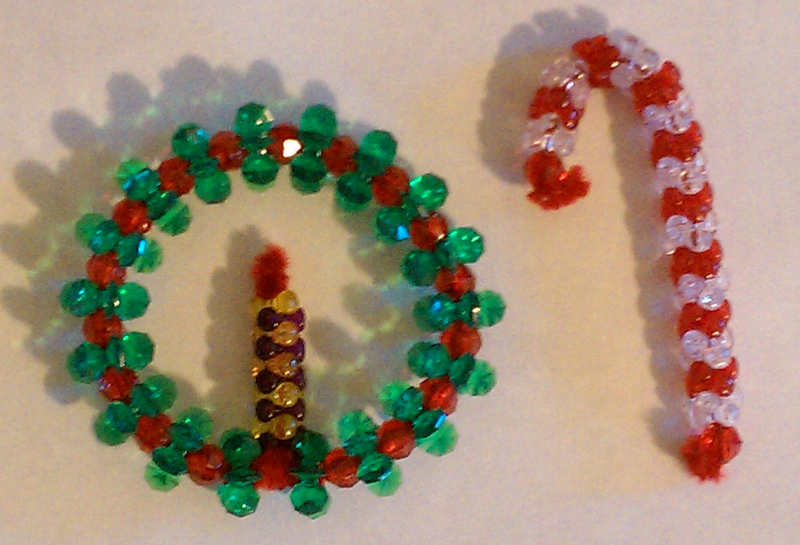 My son and I have been having fun making some beaded christmas ornaments. I remember making ornaments like this when I was a kid and thought he was at the right age to have a lot of fun doing it. I started out with something simple – a wreath and a candy cane. These are simple and cheap to make, and you have the benefit of some great bonding time with your kids! Start by putting one green paddle bead on the pipe cleaner, then add a red faceted bead. Continue with this pattern until all the red and green beads are gone. One end of the pipe cleaner should have about 1 inch sticking out. Bend the beads into a circle and wrap the short end of the pipe cleaner around to secure the circle. Take the long end of the pipecleaner and twist it so it sticks up in the center of the wreath. String 10 tri beds on this end to create the candle (my son got creative and created a striped candle). Take the free end of the pipe cleaner and tuck the end into the top of the candle to create the flame. You can finish this by tying a red bow out of narrow ribbon and gluing to the bottom of the wreath just under the candle. Loop clear thread through the top bead and tie into a loop to create a hanger. Start by stringing one red faceted bead on the pipe cleaner. Leave about one inch of pipe cleaner free on the end. Then string on 2 white tri beads and then 2 red tri beads. Once those beads are gone, string on the last red faceted bead. Tuck each end of the pipe cleaner into the top of the red beads. Bend into a candy cane shape. Finish by tying a green ribbon around the middle of the candy cane and tying on a clear thread hanger at the top of the candy cane. Have fun! I have an idea for little christmas trees, but I need to special order the paddle beads. I will post a picture when done. This entry was posted in Holidays, Tutorials. Bookmark the permalink. Thank you so much for posting this pattern! I can’t wait to try it out! What size are your paddle/star beads? Hello NC, the paddle beads are 18mm. Enjoy making them!